The weather has been almost painfully gorgeous (during the day - night still freezing) lately here in Venice, and all you want to do is be outside. Every chance you get. The blue skies and smooth waves of our urban outdoors is wonderful, but sometimes you want to REALLY get outside, like off the grid outside. It was with that in mind that we began watching the wonderful Ken Burns series The National Parks - America's Best Idea last night, gasping with every frame at the stupendous beauty of our nation's wilderness. So, I get up kind of early this morning and head down to the beach to take in all our local beauty, still thinking about the documentary of the night before, when I see this fresh car parked on Windward. 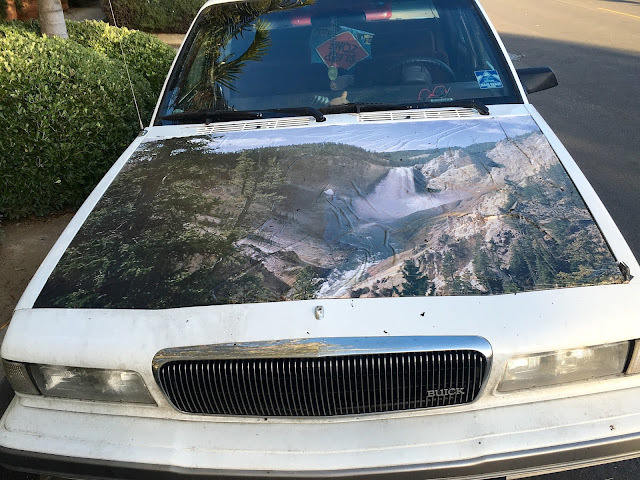 With a Yosemite-looking mural right there all across its hood. How great is that? This person must really dig the great outdoors, and therefore, I dig them. I took it as a sign (as I do) to get way out there, as often as I can. But while I'm here in town, I can just check out this car and be transported ... right into another glorious weekend. Vinny's - Cheesesteaks At The Beach!